SO sorry this is so late in getting posted! My "real" job has been kicking my booty lately!! We did our Pumpkins Close Read a couple of weeks ago and the kids did a great job on the annotations. :o) It is NOT about Halloween! It is a great passage for anytime of year. We did the annotations on the second day after re-reading. 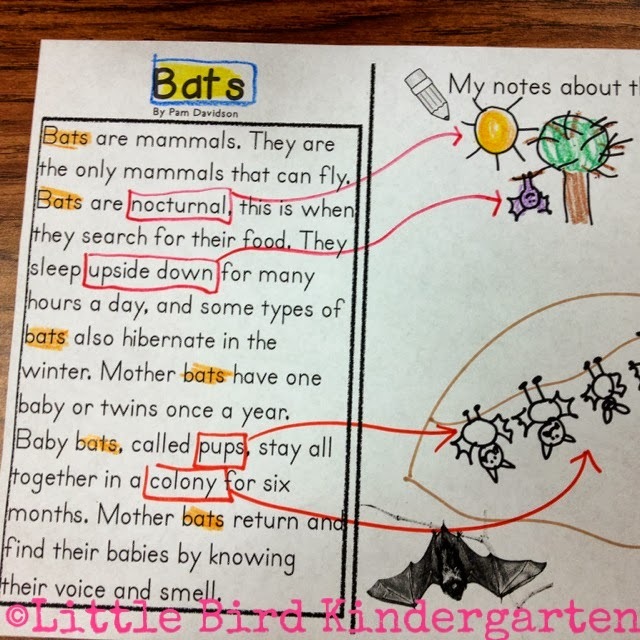 It looked much like the annotations portion of the Bats close read. I annotated one thing at a time on the smartboard (sorry I didn't get a picture of this), and then kiddos went back to seats to do what I did. 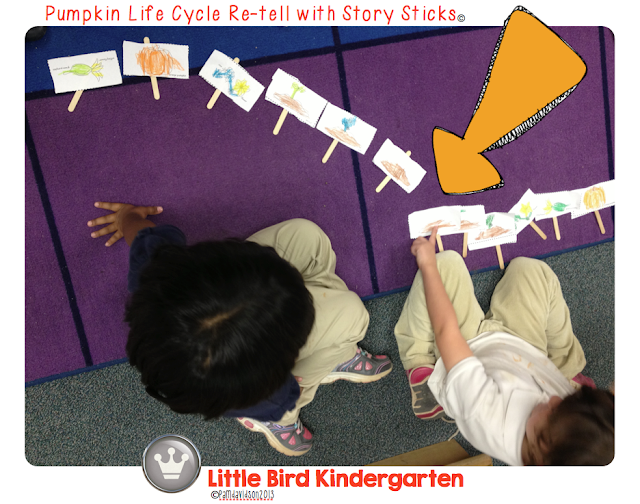 •Discussion/modeling about the title and the word pumpkins - kiddos back to seats to circle title and highlight the word pumpkins then back to floor. 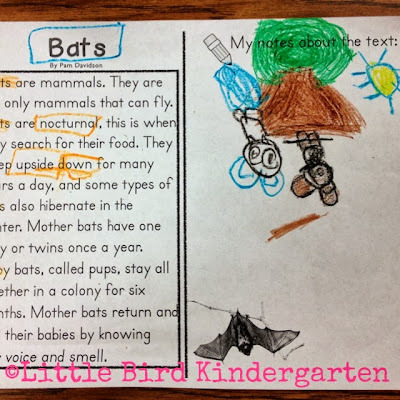 My role during this time is to support when they are looking for words within the text. It always amazes me the amount of words they remember from the readings that they are still interested in finding and annotating, or calling attention to in some way! •For "highlighting" we use yellow and orange crayons! 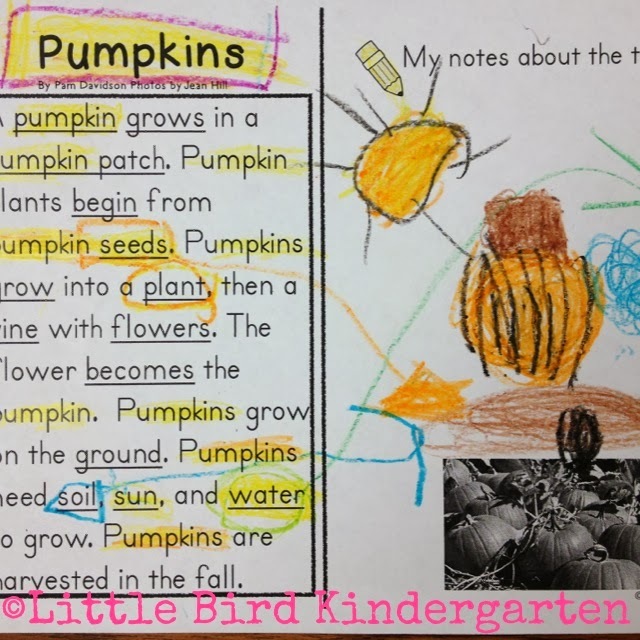 More on Close Reading in Kindergarten coming soon! 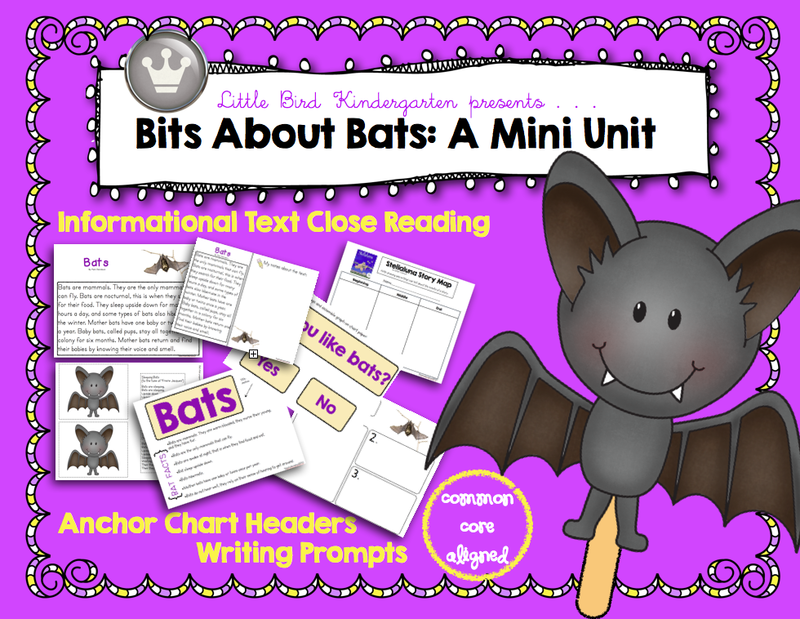 We had a little time in the last couple of days so we spent some time learning about Bats while practicing our close reading strategies too! I recently added a close reading activity with writing extensions to my Bits About Bats! mini unit. So fun! 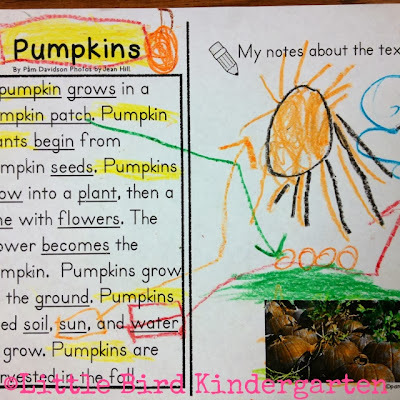 They really loved it, here are a few pictures of some of their annotations, (Since people have been asking for examples... the top annotation is mine) The day we annotated we went from floor to table first just to circle the title. Back to the floor and we discussed nocturnal, I annotated (with the sun for daytime). We also talked about the phrase "upside down". After this they went back to their seats to annoated. 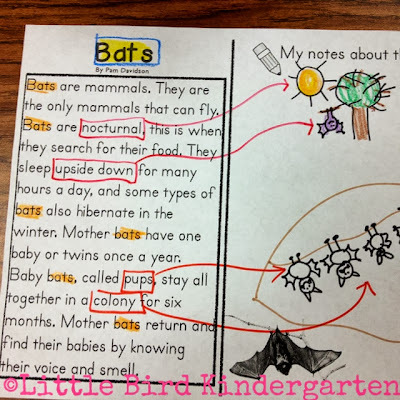 I support during this time by helping them to find words or phrases in the text (if they have trouble) that they wish to make reference to by circling the word(s) and drawing an arrow to annotate/illustrate. I'll add some more pictures this week! I have a page of resources listed in unit, here is one of the videos from National Geographic kids! Can't use U-Tube at school? Me neither! Try keepvid.com! Parent Teacher Conference Bookmark FREEBIE! It’s so true! Spread some love and inspiration with parents of your students at Parent Teacher Conferences with these sweet bookmarks to remind them of how important reading aloud is! Print - cut - tie a ribbon - done! We are, like everyone else this time of year, trying to get our kinder kids talking. They talk all day of course, but trying to get them talking in complete sentences, asking quesitons and engaging in meaningful academic conversations is....possible! The more animated I talk, teach, read, sing... etc., the more engaged they are. The more engaged they are, the more purposeful and authentic their conversations are. 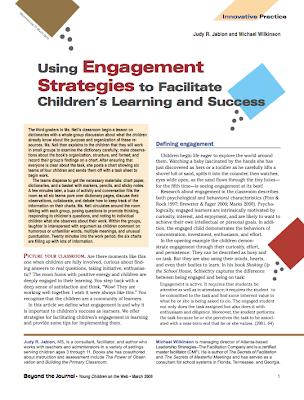 Student engagement and student to student interaction are SO intermingled. It would seem to me that you really can't have one without the other. I am BIG on kids talking together. When I am teaching I probably pose a question to them at least 6 or 7 times during a lesson, sometimes more. "Turn and ask your partner what they noticed about the ......"(partners talk) "Who can raise your hand and tell me in a complete sentence what you and your partner discussed?" 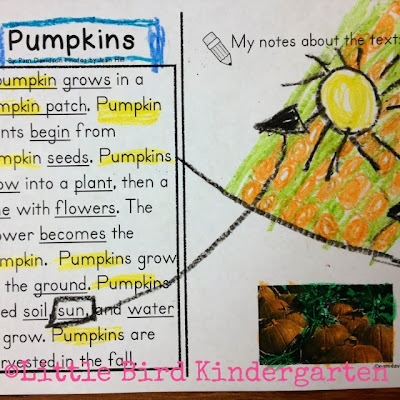 (Model sentence frame... "My partner and I noticed that......") We do this so many times a day during every content area, it is just the normal. I walk around as they talk. I listen, encourage, but mostly listen. I am not big on contrived conversations.... (peaunut butter/jelly's etc.). I've done it in the past, it's just not my preference. I just find that my kids are better at talking in a more natural way, meaning that I don't ask the person who is taller to talk first, or the jelly's, or the person with the longest hair. We just turn to our partners and take turns asking,talking, listening. Like normal people do. 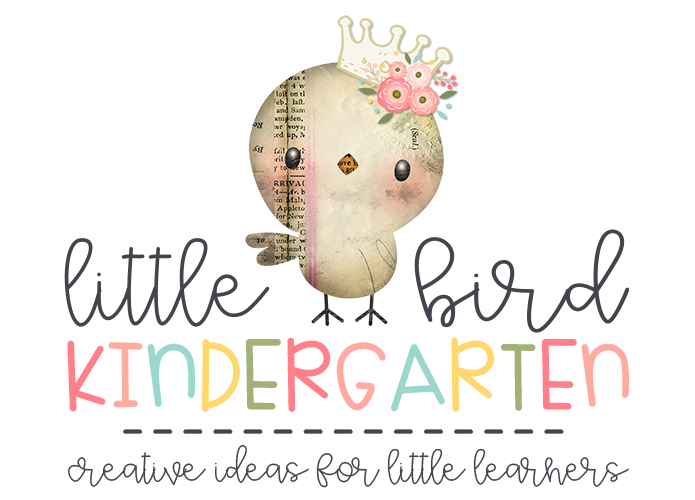 They really can do it, but it does take lots of modeling, prompting, support and practice. Now they are learning to give compliments to each other and to occasionally be asked to raise their hand and share something great their partner shared or behaved duringa conversation (LOVE the look on the partner's face :o) when they do this. Back to my nerdy love of research. 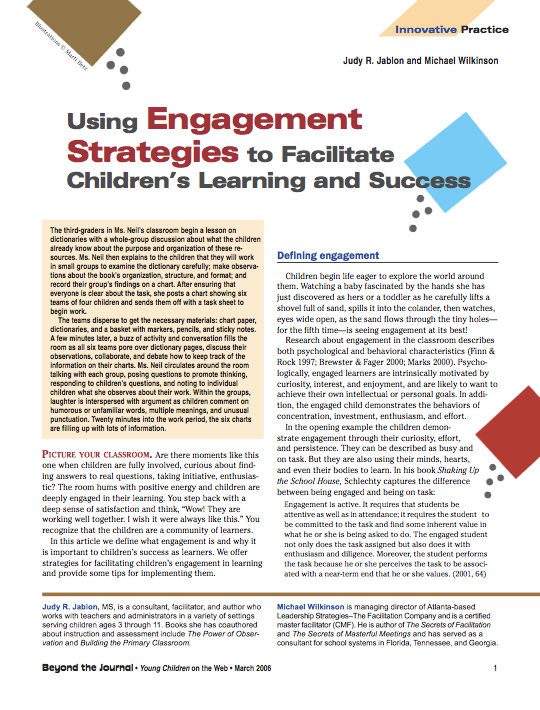 I liked this article about engagement from Beyond the Journal and I thought you might like it too! 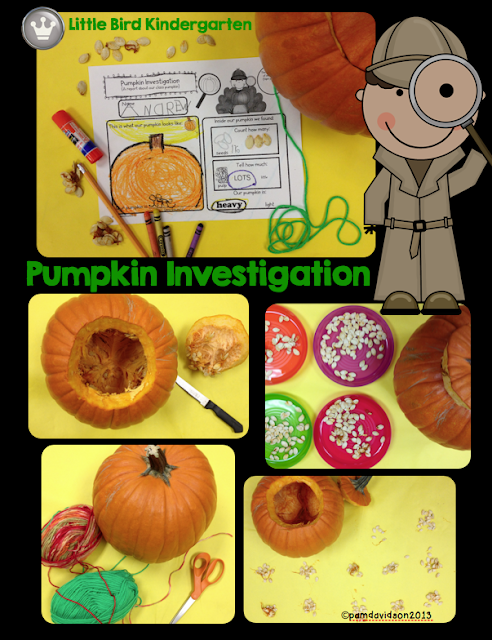 The little detective / scientists have been busy investigating pumpkins this week! The Pumpkins Close Read has been going well, lots of somewhat familiar, but juicy words to talk about! Annotiations will be next. Yesterday we did our investigation page for science. We measured the circumference with yarn, checked to see if it was heavy or light, and then we got messy! Cut it open to see if it had LOTS of pulp or only a little ! We counted the seeds and put them into piles of 10's so we could count them by 10's. It was a bit challenging to say the least with 30 and just little ol' me, but we got it done! 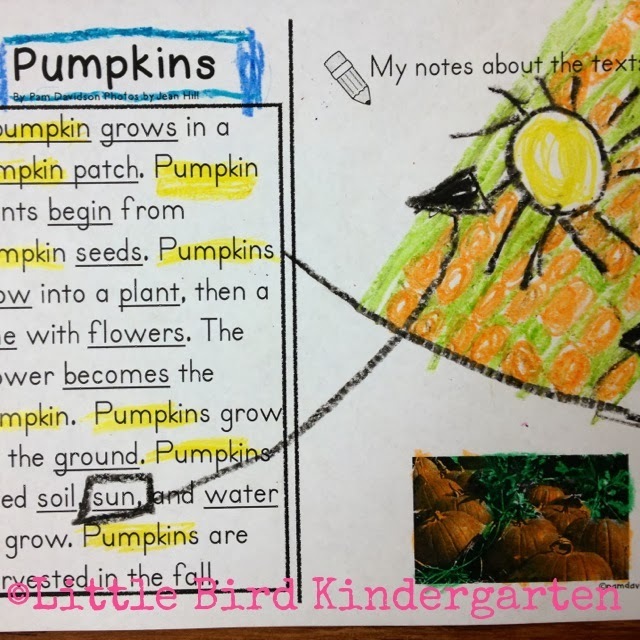 We let the seeds dry out overnight so they could glue a few seeds to their Investigation page this morning. I love how thrilled they were with the whole experience, and the natural use of great language that happened as a result. I was thinking how it would be fun to let them do two investigations for two pumpkins so that they could compare :o) but then I came to my senses and remembered how pooped I was, so there will not be a second one! LOL! 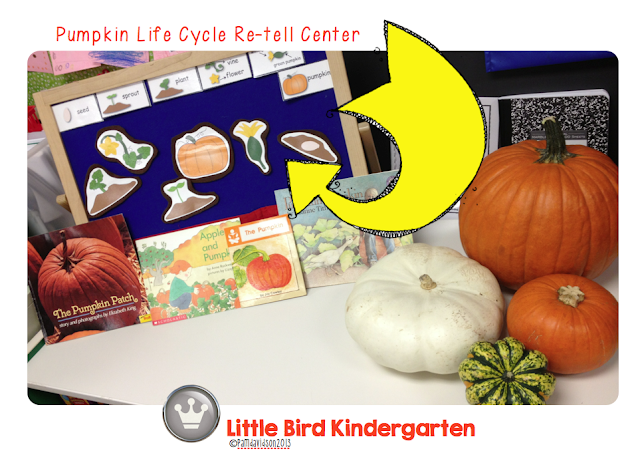 Pumpkin Life Cycle: Common Core Galore Literacy Activites and Learning Centers! We have been practicing retelling the Life Cycle of the Pumpkin with the felt figures in centers (so awesome to hear re-tells with non-fiction!). 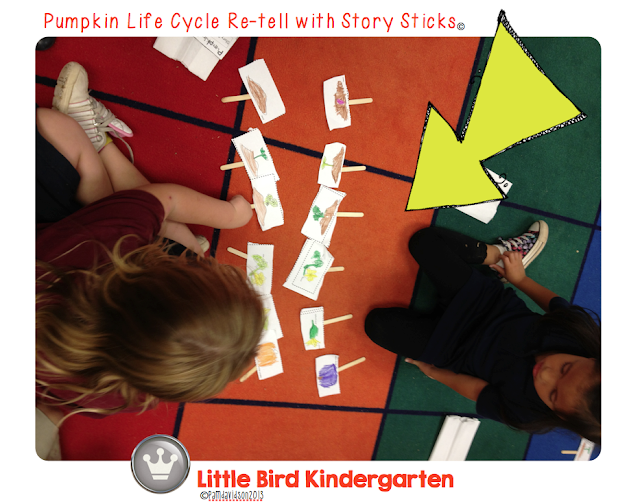 On Thursday we made our individual story sticks and practiced re-telling with partners. They did so GREAT! It was one of those activities that made me glad that we invested the time and energy to go deeper into the content. The re-tells and the conversations that followed were so rich. Full of relevant vocabulary and questions. It is also amazing to think about the number of objectives crossing content areas that come into play in a culmination activity such as this. Science, Math, Social Studies, and Language Arts all rolled up in to one big orange ball! Apple Close Reading and Fun! We worked on "Apples Sweet" the last couple of days (Close Reading poetry passage). we had established lots of good background information. It was our first poetry close read, and it was really fun! They loved acting out the peeling, slicing, and biting vocabulary, and talking about the apple seeds. 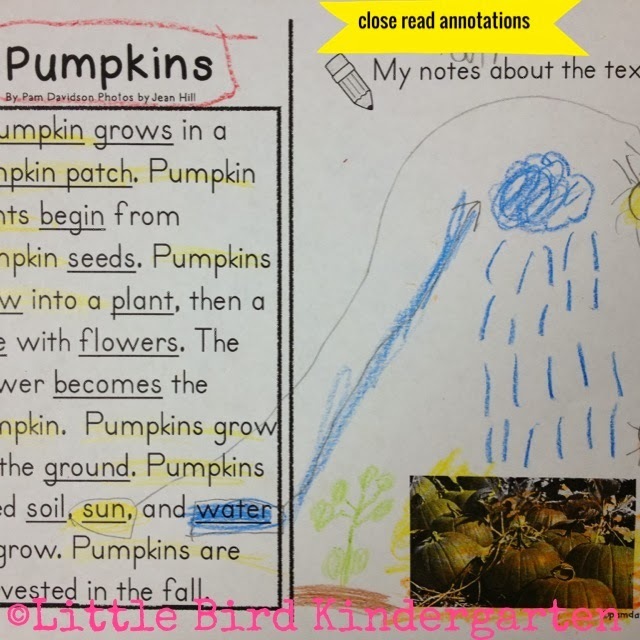 We worked on annotations the second day, and they did much better this time than the last at zoning in on words that they were interested in annotating. 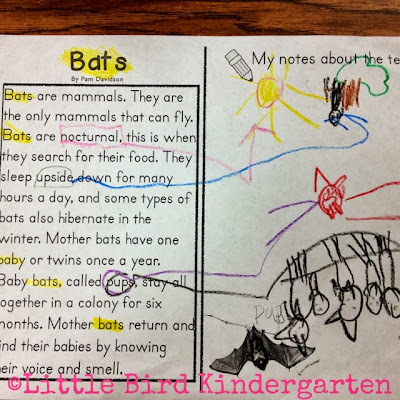 It is really interesting to watch them process the information and then create the pictorial representations to create connections to the text. Just for fun... we taste tested (tied into our talk about the 5 senses last week) red, green, and yellow apples with peanut butter and caramel (just like in the poem!) Of course they loved it, and then they posted their vote for their favorite way to eat apples on our graph. ( I created the graph, laminated it for future use) and had them use sticky notes for their votes. 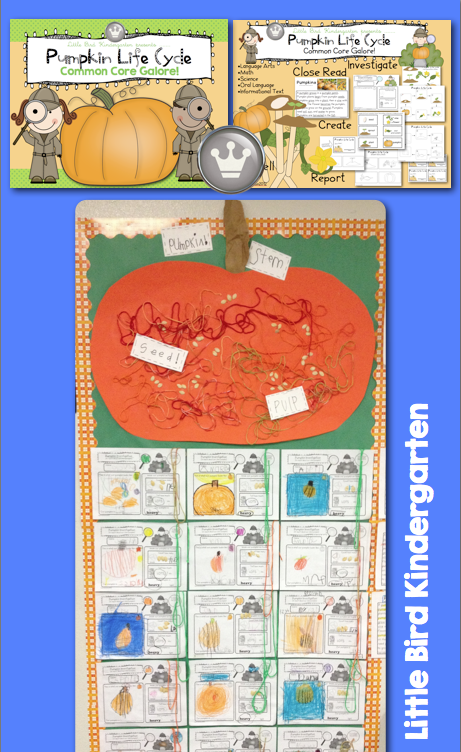 We didn't have time for a full blown apple unit, but it tied in nicely to our fall unit, and sure was a fun way to bite :o) into the content, while attacking reading, math and science objectives!